Globally, the energy storage market is at an interesting stage. Age old technologies like lead-acid and nickel-based batteries are predominantly used in various applications. But in the last two decades, the maximum use of Li-Ion chemistries are taking the center stage of newer applications. The future is not only about Lithium Ion batteries but of other technologies also which provides advantages in various parameters over Li-Ion. These technologies include Sodium-based batteries (NaS, NaNiCl2), flow batteries (VRB, ZBR), Zinc-Air, Aluminum Air and others. Some of these technologies provide a very high cycle life cycle and are suitable for long duration applications. Globally, various companies are working on these technologies in the prototype scale or limited installations. Due to the lack of modularity, a liquid electrolyte, low efficiency and low scale of manufacturing restrict some of these technologies for wider usage. 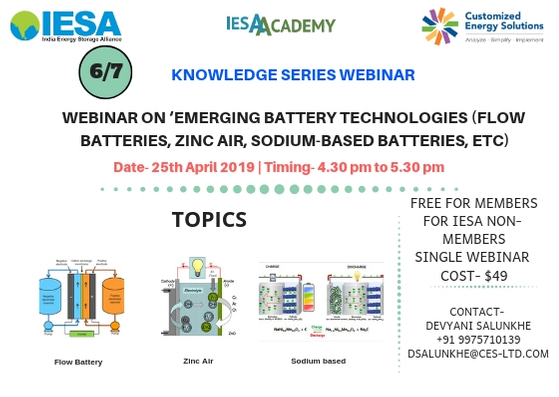 In this webinar, the experts will discuss the technology parameters, applications, challenges and advantages of these technologies. Additionally, they will also discuss India’s market opportunity for these technologies.